Ah, money. There's nothing like the sound of coins clinking in your hands. You vastly prefer it to the sound of coins clinking in someone else's hands, or the sound of coins just sitting there in a pile that no-one can quite reach without getting up. Getting up, that's all behind you now. Life has been good to you. Just ten years ago, you were tilling your own fields in a simple straw hat. Today, your kingdom stretches from sea to sea, and your straw hat is the largest the world has ever known. You also have the world's smallest dog, and a life-size statue of yourself made out of baklava. Sure, money can't buy happiness, but it can buy envy, anger, and also this kind of blank feeling. You still have problems - troublesome neighbours that must be conquered. But this time, you'll conquer them in style. This is the 4th addition to the game of Dominion. It adds 25 new Kingdom cards to Dominion, plus 2 new Basic cards that let players keep building up past Gold and Province. The central theme is wealth: there are treasures with abilities, cards that interact with treasure, and powerful expensive cards. 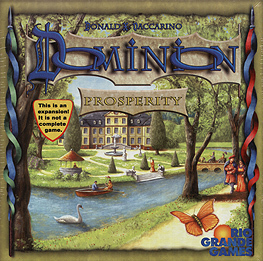 Dominion: Prosperity is an expansion, and cannot be played by itself; to play with it, you need Dominion, or a standalone expansion to Dominion (e.g. Dominion Intrigue). Those provide the Basic cards you need to play (Treasure, Victory, and Curse cards), as well as the full rules for setup and gameplay. Dominion: Prosperity can also be combined with any other Dominion expansions you have.